Man alive! Imagine Bill Maher when he wants to sound condescending. For those lagging behind Mr. Maher’s high horse: climate is temporary weather changes, aggregated in patterns over time. Hence, weather v. climate. Get it? So let’s examine climate. What span of time determines climate change? A decade? A century? A millennium? Hundreds of millennia? You will notice that evidence for climate change is unquestionably present, but evidence for man-caused (anthropogenic) climate change is inconclusive at best. Pick the last decade, and you will notice the Earth’s average temperature generally flatlining. Pick a quarter century, and you will notice the last quarter century generally warming and the one before that generally cooling. Pick a millennium, and you will notice a massive warming period during the Middle Ages comparable to today’s disaster scenario. Thus, despite an irrelevant insistence on the difference between “climate” and “weather,” Mr. Maher was unable to produce the evidence to link patterns in climate change to patterns of human behavior (again). 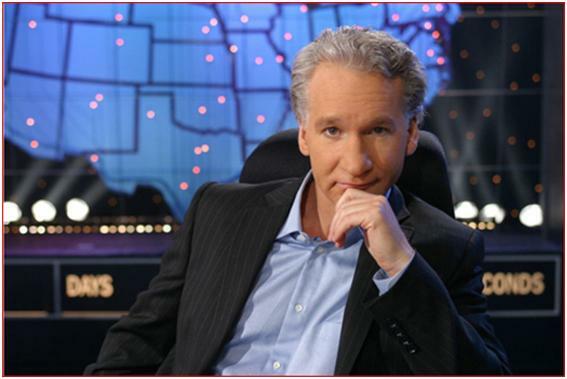 In an unrelated development, Mr. Maher has proved why smugness is a hopeless argumentative strategy (again). But perhaps not always. Let’s try smugness out for ourselves, shall we? I don’t want to sound condescending to Bill Maher when I say, “do you understand the difference between reality and fantasy?” Surely, he does not deem the Climategate scandal a product of someone’s dream. But instead of retracting our culture of hysteria, warming advocates have doubled down and have dubbed global warming a misnomer for a phenomenon that has always been climate change. Thus, released CRU data actually proves climate change, while thoroughly disproving global warming. Understand? The apocalypse remains. Climate change is real. Well if that’s the point, then global warming skeptics will also agree. Does Bill Maher know the difference between climate change advocates and skeptics, who both agree that climate changes? The difference is that climate change advocates tie recent climate change to the burning of fossil fuels. Skeptics do not. 1. Climate must be considered extreme during the era of fossil fuel use. Otherwise, any cause for concern is imprudent. Well what is extreme? Is every instance of extraordinary weather now evidence of climate change? Even the crushing force of the last two years’ winters and other weather phenomena do not prove anything out of the ordinary if compared to other similarly extraordinary instances of weather throughout history. Why do we rarely hear climate change advocates putting today’s weather into its broader historical context? (Did they forget the definition of climate?) More importantly, if climate change is, by definition, erratic weather, then will the fires of the climate movement only be quelled with the impossible: perpetually moderate weather? Bill Maher seems to believe we are stupid enough to accept this unreasonable logic. A great example of an unusual ecological phenomenon comes from a few months ago, when many hundreds of fish and birds died at once in several places across the country. Of course, climate change was a candidate theory. But it turned out that these were normal occurrences. We are merely more in tune to such phenomena today because of how telecommunications have developed, and, frankly, because we’re looking for crazy ecological phenomena. Without historical context, contemporary biases tend to hide the truth while illuminating everything else. 2. The use and disuse of fossil fuels must be directly correlated to climate change. This was the failed goal of the CRU at the University of East Anglia. No one has yet to prove their fudged results to be accurate. A peculiar discrepancy is that despite a considerable worldwide decline in industrial production and use of fossil fuels due to the recession, global warming is said to be worse than ever. Good theories lack such obvious contradictions. 3. Other explanations, besides fossil fuels, must not adequately correlate with climate change patterns. Though the climate change community remains immune to other explanations, I have heard several alternative theories worthy of consideration. These theories involve shifting currents of material below the earth’s surface, sunspots and sunshine, regularly oscillating wind streams, and the sun’s expanded magnetic field. In sum, we need to know (1) that there is extreme climate change, (2) that it is correlated with fossil fuel usage, and (3) that this correlation is more substantial than alternative theories. Until these three conditions are met with some scientific analysis, anthropogenic climate change cannot possibly be proven, regardless of how many people know the difference between weather and climate. P.S. : Bonus points for anyone who sticks around to listen to Mr. Maher resort to an argument against evolution to prove his point on climate change. Those who think humans can cause climate change do not understand how vast the globe is. They also do not understand that global temperatures have oscillated between ice ages and temperate periods. If they ever understood then they would have explained previous causes of climate change and proved that they are no longer operational in which case anthropogenic factors should be considered. Homo Sapiens Sapiens the ones with cranial capacity of 1450cc as contrasted to Homo Sapiens (with 1400cc) have lived on earth for about 42,000 years only. The climate has changed over much longer periods and probably caused the extinction of dinosaurs. To read about credible climate change theory accounting for all the processes and observable phenomena from ice ages to what happens to date, visit http://www.climatechange.epitomeillustrations.com.